Our Odd Mage deck list guide for the Rastakhan’s Rumble expansion features one of the top lists for this archetype. This Mage guide includes Mulligan Strategy, Gameplay Tips, Card Substitutions, and Combos/Synergies! Odd Mage is a control archetype revolving around the great value generated by the removal capabilities of the upgraded hero power and the synergistic cards like Daring Fire-Eater and Pyromaniac. 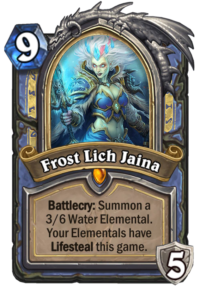 Your strategy is almost always to outlast and exhaust your opponent, slowly generating an endless stream of Water Elementals once Frost Lich Jaina hits the board. In many ways, this is going to be the last hurrah of Mage’s Death Knight before the impending rotation marks the end of the Year of the Raven – and appropriately enough, the final expansion of 2018 has certainly given the grindy Mage archetype a lot to play with. “Big Spell Mage” was on the fringes of the metagame for a long time, and while it was always excellent at clearing wide boards and winning with the Death Knight in ultra-lategame scenarios, mid-sized threats were always an issue for the deck, something which the strong hero power has alleviated surprisingly well. That being said, the Odd restriction means the loss of Polymorph and Meteor (alongside Blizzard), which means getting through the first turns until the promised land of Jaina is nowhere near guaranteed. Still, Blast Wave is an excellent pickup, and the combination of these changes makes Odd Mage surprisingly more effective against aggression than some of the ultra-sticky or “solitaire-like” Control decks that defined parts of the early Rastakhan meta. Check out alternative versions of this deck on our Odd Mage archetype page! Daring Fire-Eater – It might seem like an innocuous little critter, but keep in mind that you’re much more reliant on your hero power as a removal tool than previous Control Mage iterations used to be – as such, the ability to deal four damage for essentially three mana is incredibly useful against cards like Hench-Clan Thug in certain aggro matchups or utility tools like Mana Tide Totem against slower opponents. 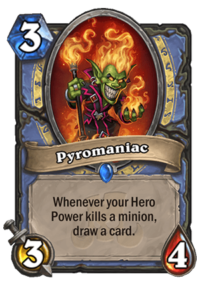 Pyromaniac – This is basically the Swiss Army Knife of your early-game option, a well-statted card that pretty much has Taunt against aggressive opponents and will almost always replace itself in slower matchup – also, crucially, its decent size provides a reasonable tempo option in those games (Druid, Kingsbane Rogue etc.) where you have to assume the beatdown role. Dragon's Fury – This is still your premiere shutdown tool against early board floods – however, it’s a bit of a double-edged sword as it is pretty much useless in those cases where you have to take the wheel and attack on the board. Keep it you are certain that your opponent is playing aggro or if you feel like you have adequate resources to go forward even if it turns out to be a dead card. Jan'alai, the Dragonhawk – It’s pretty shocking how reliably you can get Ragnaros out on curve with this deck, and that is certainly a fantastic play to look out for – however, it’s evidently too slow against faster opponents, meaning you should probably pitch it against aggro to look for another removal tool. Gluttonous Ooze – Those dastardly Druids and their Twig of the World Tree definitely requires a shutdown tool as early as possible, and it’s also fairly important if you want to have a chance against Kingsbane Rogue – which is a terrible matchup but not an unwinnable one. Needless to say, it also has some utility against most Hunter decks as well. Frost Lich Jaina – Since so much of your late game strategy hangs on the presence of this card, I’d certainly keep it going second in almost every case, and it’s worth sticking with in Control mirrors even if you only start with three cards. While this kind of a deck was historically very good in long and grindy matchups, the current metagame we’re seeing Rastakhan puts it in a weird position: with a wide variety of OTK-esque finishers ranging from King Togwaggle to Kingsbane and shenanigans with Uther of the Ebon Blade, these are actually not the matchups you’re targeting this time around. Instead, it’s the aggressive opponents who are going to fear your name: it’s incredibly tough to get onto the board against this archetype. You need to put a premium on consistent minion removal in these matchups – not only because this is what your deck excels at in the first place but also due to the relative scarcity of healing options until the hyper-lategame. Frost Lich Jaina is almost guaranteed to be your closer: your main job is to minimize the incoming damage until you find a safe moment to play her at some point. That isn’t to say you can’t find spots to take over the board: once you’ve cleared your opponent with either Dragon's Fury or Blast Wave, Astromancer and Jan'alai, the Dragonhawk can give you an early opportunity to flip the tables – and needless to say, once you manage to establish a stable board presence, your opponent is pretty much down to burn options as a win condition. The more resource-intensive the aggro archetype, the more patient you’ll have to be. 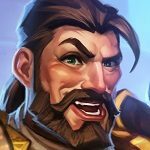 Something like Odd Paladin has a much easier time refilling the board than Zoo does – therefore, paradoxically, you should try to get the former to commit more before wiping the slate clean. You have a very important to decision to make early on in the slower matchups: it’s imperative to figure out whether you’re the beatdown or your opponent. You’ll be surprised to find how often you’ll have to go on the attack: many of the aforementioned archetypes (Togwaggle Druid, Kingsbane Rogue, OTK Paladin et cetera) pretty much auto-win against you if the game goes on for a long time. In these cases, you need to relentlessly emphasize early tempo with cards like Pyromaniac and Black Cat in order to push repetitive damage. Needless to say, Jan'alai, the Dragonhawk is a pretty important piece of the puzzle in these matchups; also, you are capable of dealing a surprising amount of damage with your hero power. If you can manage to keep up a wide board, Alexstrasza can serve you very well as a surprise finisher. Otherwise, the strategy is fairly similar to what you saw with the old Big Spell Mage archetype: hang in there on tempo before Jesus and Frost Lich Jaina take the wheel. The infinite loop of Water Elementals is still strong enough to put you over the top against most non-OTK Control opponents. With the new Rastakhan cards, Odd Mage is a bit on the expensive side a mid-tier deck when it comes to the Dust required to build it – since Blast Wave (and Astromancer are Epics and Jan'alai, the Dragonhawk is a legendary, you’ll likely require significant investment for the featured build. You can find a short rundown of the pricier cards below and certain replacement options depending on what kind of a metagame you’re facing. Frost Lich Jaina – Evidently, the Death Knight is a must, and since she will rotate out at the start of 2019, it might be a bit of a steep proposition to craft the card if you don’t yet have it. Unfortunately, it is impossible to replace. 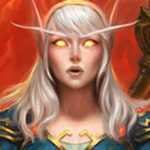 Alexstrasza – As we’ve previously discussed, this old stalwart is a pretty important element in clutching improbable wins in otherwise problematic matchups while also doubling as a huge heal against aggro. Baron Geddon – It’s just too good a heal proposition once the Death Knight is in play not to include. Jan'alai, the Dragonhawk – Needless to say, this card has great synergy with the archetype (and probably one of the strongest on-curve plays available on turn seven), but it can potentially be replaced by a different large threat: options include a or even a Ysera, or perhaps Dragoncaller Alanna. As you can see, most viable replacement options are also on the expensive side. Astromancer – It might seem like an odd inclusion at first but it’s basically a budget version of Jan’alai, a big bomb of stats to create some much-needed board presence (and almost always superior to Spiteful Summoner in this deck. You can sacrifice these to improve your aggro matchups even further by including cards like Witchwood Grizzly or even Zilliax to replace them – personally, I’ve opted to include the latter over the second copy of Tar Creeper in my particular build. I just played against this deck and Astromancer dumped a Grand Archivist onto the board, who then cast Flamestrike out of the deck. I cried a single tear and conceded my win streak the next turn. I feel like glacial shard is a better fit for odd mage than firefly. Can be used to generate a water elemental, synergises with blast wave and is a better draw in the late game as stall to force board clear overcommitment. Early game the hero power is effective enough whilst glacial can be used to help early tempo too, thoughts? Right now, I’m really not convinced it’s worth running Odd Mage over traditional Big Spell Mage builds ’cause the exchange for upgraded Hero Power is way too savere. 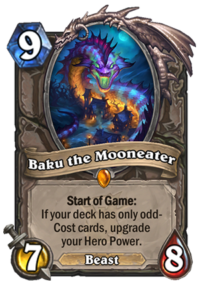 You can make a case about Blizzard and Meteor, but Polymorph’s the real problem here: This card was your only tool against Taunt Druid, your premiere rival in slow matches. Another problem with the archetype is that is somewhat tries to bridge the gap between controlish and mid-game playstyles. If it’s against Aggro, you try to survive. If it’s Control, you try to Rush them. In Big Spell Mage that would be just wrong. Regardless of what you’re playing against, BS Mage’s strategy was to outlast it then beat it with one of its main Win-Conditions, after the mage player made sure their opponent couldn’t counter it anymore. On the other hand, the author makes a good point that a lot of OTK strategies can casually stomp you on the late game. I’ll give it some time before I decide on what to do with this deck, but I think Big Spell Mage with the addition of the Dragonhawk is the way to go for Mage in this expansion. While you make a point about Polymorph being one of the most important cards for this deck, Taunt Druid has shown no sign of life since well into Boomsday, it’s extremely fringe and not even worth running really, so Polymorph becomes a more reasonable sacrifice once you consider that taunt druid isn’t as common as it was in Witchwood. In addition, the Deathrattle Druid deck which tries to revive Taunt Druid is not affected by polymorph anymore. The whole point of Polymorph was that it added more beasts into the Witching Hour pool for the druid so that they have a chance of reviving a sheep instead of Hadronox. That’s been circumvented with the Undatakah card. Otherwise, I do agree it feels more mid-rangey than control, but I don’t really see an issue with that since the deck is still running big spells and Alannah is still a secondary win condition, in the same way big spell mage was. The only difference is the hero power synergy package that Rastakhan introduced gives it more early game aggression, which, in my opinion, was a problem for this deck against more aggressive enemies like Odd Rogue. If you aren’t trying to Geist and then poly the hadronox, then you are not playing it correctly. If you poly the spider, undatakah is pretty much useless. The only hope odd mage has against the new taunt is teching in silence which only might hit undatakah. Otherwise its a terrible matchup. My mistake, I tested silence on deathrattle minions and Undatakah takes the deathrattle effect even if the minion died while silenced, but if it got transformed with polymorph I imagine Undatakah won’t steal the effect.